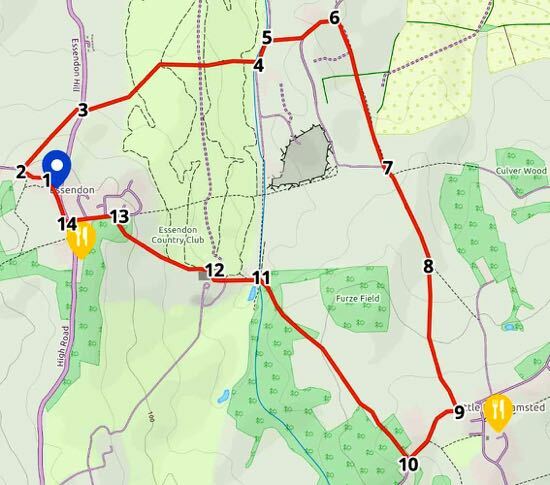 This walk has some hilly parts and crosses a golf course, but all the paths are easy and well laid out and it's a great circular walk if you want a bit of up and down. And there are some good views across the rolling Hertfordshire countryside. Park either by the church in Essendon village (or on School Lane if there is no space). Walk down West End Lane with the church on your left. As you pass the last house on the right, you will spot a footpath sign and a gate on your right. Go through the gate and follow the footpath (Essendon footpath 5) across the field to the B158. Cross the road and take the footpath (Essendon footpath 5) directly opposite. Go down that path, through a couple of gates eventually emerging on the golf course. Continue along the path until it splits. You take the right fork (Essendon footpath 2). Once you have crossed the golf course you come to a small footbridge. Cross this and turn left on Bedwell Avenue (Little Berkhamsted bridleway 26). Continue for a few minutes looking out for a footpath signpost on the right (Little Berkhamsted footpath 1). Take this footpath, cross a small bridge and climb the hill. On the other side of the field you reach a gate. Go through and turn left on the lane (Little Berkhamsted bridleway 18). Follow the lane until it reaches a house on the right called South Lodge. Immediately after South Lodge you will see a footpath sign pointing to your right (Little Berkhamsted footpath 4). Take the footpath, cross three fields and eventually emerge at the top of a small lane. 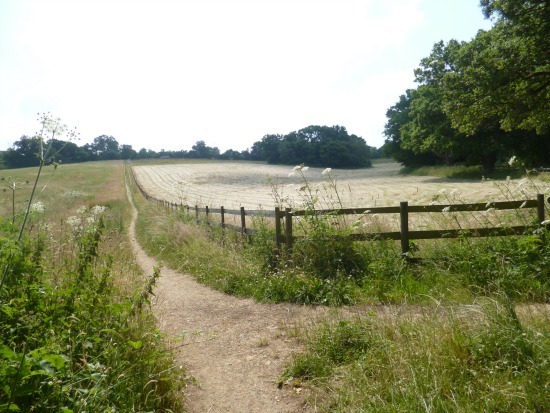 Continue straight along the bridleway (Little Berkhamsted bridleway 18) to the left of the house and climb the hill until you reach a small footbridge. Immediately after the footbridge, where the path forks, take the right fork (a continuation of Little Berkhamsted bridleway 18) and continue climbing until you reach Little Berkhamstead Lane. (At this point you have the option of popping into Little Berkhamsted for refreshments where you will find a village shop and The Five Horseshoes pub). Turn right on the lane and walk down the hill until you reach a bridleway on your right just before the road bends to the left. 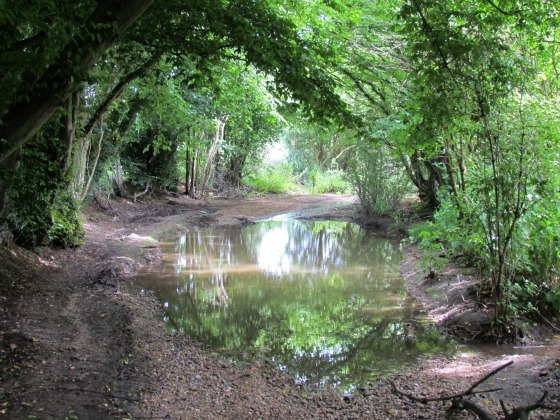 Walk down this bridleway (Little Berkhamsted bridleway 17) until you come to a farm. Continue through a gate and along a bridleway with fields on either side. This track drops down through woodland until it reaches the golf course. At this point you will be in an area that looks a bit like a building site. Continue to walk straight ahead (west) and up the hill following the footpath (Essendon footpath 4) through the golf course and up to the club house. There will be bunkers of sand and gravel on your left where the golf club stores course material. When you reach the club house follow the signs and turn right and then left keeping the buildings on your left. Climb the hill and follow the footpath across another fairway and into the woodland. This path eventually reaches a lane. Turn right and continue until you come to School Lane. Turn left on School Lane and continue until you reach the B158. (At this point you have the option to turn left and visit The Rose and Crown if you want refreshments). If not, turn right. On your left you will see the fork that takes you back to the church.